*The price is 17500 EUR and can be paid on monthly installments for up to 6 months. 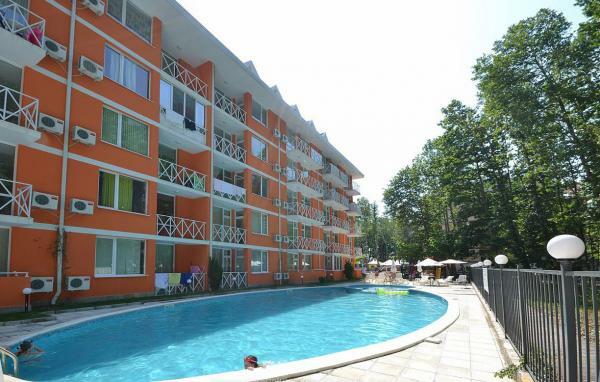 The complex of holiday apartments GERBER RESIDENCE- 2 is located in the southern part of the distinguished Bulgarian resort Sunny Beach. The project is located west of the main communication artery Nessebar – Sunny Beach – Sveti Vlas. The building is located close enough to the beach-within 5 min walking distance.The city of Burgas and the International airport are situated 30 km away. The building is designed for seasonal use but it can function all year round. The apartments are accessible through a controlled by the security entrance. The necessary communication and security installations, cable TV and Internet, as well as air conditioning are in place. On the eastern side of the building is a large outdoor pool with children’s section .The space around the pool is designed as a large recreation area with loungers and umbrellas available for guests in the complex. -Kitchenette: sink and cupboards with the necessary electric terminals, water-supply and sewerage installation.